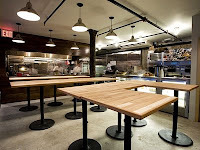 YummyInTheCity: Momofuku Milk Bar - Has David Chang gone too far? Momofuku Milk Bar - Has David Chang gone too far? Momofuku Milk Bar - Last week I paid a visit to Milk Bar, a small spot located in a corner tucked behind Ssam Bar, serving up a variety of desserts and snacks ranging from soft-serves, cakes, pies and cookies. Now as you can see from past posts, I am a big David Chang fan and have followed his meteoric rise in the NYC food scene over the past couple of years. However, with the opening of Milk Bar- I have to wonder if he has gone too far out of his comfort zone. Initially Momofuku did not serve desserts at its original conception, and when it started adding desserts they were certainly not the highlight of his menu. At Ko, the desserts at the end of a glorious tasting menu were a big disappointment for me. So...why on earth did he open a bakery and dessert bar? It may take me a while to figure this one out- but the only reason I can come up with is to exploit his growing fame and ride the wave of "Momofuku" love that the city has given him. For me, the desserts I tasted were awful. Just awful. There is no other way for me to describe it. The Salty Pistachio Soft Serve - Salty. Salty. Salty. The Candy Bar Pie (basically a Reese's pieces pie with pretzels) - Salty. Salty. Salty. Now I know some people love the "salty/sweet" combo for breakfast - but for dessert- sweet is usually better than salty. The Snicker Bar Soft Serve - Salty Chewing Gum. Just plain weird. It was only after I walked a couple blocks down to Dessert Club Chickalicious and got their fantastic Vanilla Bean Soft Serve with hot fudge sauce that I could finally get rid of the awful salty aftertaste of Milk Bar. Maybe my taste buds are just not sophisticated enough for Milk Bar, but if you ask me - this place is not dessert in the conventional sense of the word. Caution: Children will probably beg for Serendipity or Max Brenner's afterwards. And at $5 a pop it's a pretty expensive experiment with a low expected success rate. My tip- skip Milk Bar and head on down to the myriad of nearby dessert options - Dessert Club Chikalicious, the Dessert Truck, or Max Brenners. Any of these options will satisfy the sweet tooth without the sodium overdose.